The bad news is that my skis, or more specifically my bindings, aren't great for a tour of this distance. 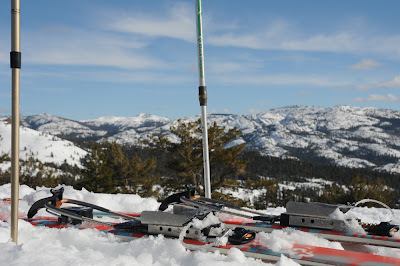 My 22 Designs Hammerhead setup (on G3 Rapid Transits) is great for the resort because they are some of the most solid, consistent, and burly telemark bindings on the market. But they don't have a free pivot tour mode to give the foot full range of motion while touring/skinning. So what's the good news? Yu, the second member of this trip and a fellow telemark skier, knows a number of folks with various telemark setups. He made a few calls and hooked me up with a pair of 185cm Black Diamond Voodoos with Black Diamond O1 bindings. The bindings will surely give me a comfortable tour and I'm looking forward to trying out the Voodoos on the steeps.